Moorings and platforms are structures that allow water scientists to position instruments, collect samples, and take long-term measurements in waterbodies. A mooring typically consists of a flexible cable that is tethered to the ocean floor by a weight or anchor and suspended from the sea surface by a buoy. A platform has a flat workspace for instruments and people, and can be free-floating, moored to the seafloor, or rigidly fixed in place. Instruments that measure physical and chemical aspects of the oceans and atmosphere can mounted on or suspended from a buoy. Together with shipboard and satellite data, the global network of measuring sites provides further understanding of the ocean-atmosphere system and its influence on global climate and biological productivity. and platforms. Oceanographers measure physical and chemical properties such as temperature, salinity, current velocity and turbidity—the amount of suspended sediment and other particles in the water—using equipment suspended beneath the sea surface on mooring cables. Marine biologists collect water and specimen samples, conduct dives, and make observations of marine flora and fauna from platforms. They also use oceanographic information to study the distribution of marine ecosystems . Marine geologists collect seafloor samples and sub-seafloor cores that hold clues to the Earth's geologic history and past climate, as well as clues to the location of petroleum reservoirs , from fixed platforms. Moorings and platforms often accommodate numerous pieces of measuring equipment. This economical approach allows scientists to collect several types of data at a site, to compare data from the site, and to observe data patterns that affect a number of natural systems. Changes in current direction or temperature within the water column, for example, may correlate to changes in biological productivity or weather patterns. 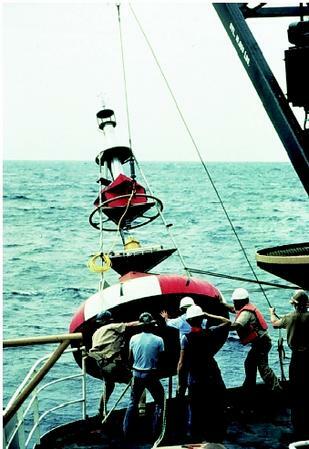 A typical oceanographic mooring, like one deployed in the northwest Atlantic Ocean by the Global Ocean Ecoystems Dynamics (GLOBEC) program, holds a large array of instrumentation: seven current meters, seven temperature gauges, three optical turbidity scanners, four salinity/conductivity/pressure meters, and one Acoustic Doppler Current Profiler (ADCP) that records surface ocean current patterns around the mooring. The GLOBEC mooring buoy houses instruments that record wind speed and direction, air temperature, relative humidity, and amount of sunlight reaching the buoy at the sea surface. Tethered moorings and platforms are deployed from ships and left at their sites to record data for extended periods of time. The GLOBEC moorings were deployed for 5 years and serviced every 6 months. In the past, ocean scientists had to retrieve data from recorders at such "stand alone" moorings during return visits to the sites. Modern moorings, however, now include transmitters that beam data to scientists' computers via satellite. They also carry global positioning system (GPS) instruments that measure their precise location over time, and transmitters that relay information about mechanical difficulties at moorings. Some systems can even receive signals to adjust their instruments. These technological advances allow continuous data monitoring at land stations, improve data quality, and reduce the number of expensive visits to mooring sites. An international initiative called the Global Ocean Observing System (GOOS) is a global scientific collaboration that seeks to collect data from moorings and platforms all over the planet, and to compile those data into a global database that would be available to scientists for comparison and analysis. Tethered moorings and platforms are designed to reliably collect, record, and transmit accurate data while submerged in corrosive saltwater and exposed to extreme weather conditions for long periods of time. Their buoys have heavy-duty steel or aluminum flotation collars, resilient solar panels, batteries for backup power, safety devices such as beacons and radio transmitters, and insulated, reinforced wells that protect sensitive scientific instruments. Mooring cables, while flexible, are extremely strong. Electronic cables that carry data from the submerged instruments to the sea surface are encased in an insulating sheath that surrounds the tether. Anchor weights, which are designed to hold moorings in place indefinitely, can be mechanically or electronically signaled to release when it is time to retrieve the mooring. The data collected at moorings and platforms give scientists the information they need to pursue some of the most pressing scientific and environmental questions of the twenty-first century. 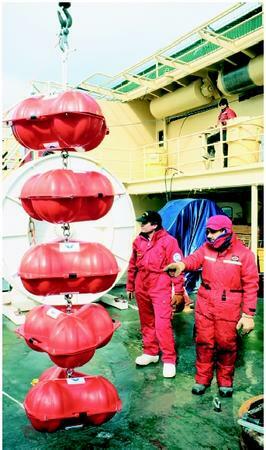 Here, oceanographers with the National Oceanic and Atmospheric Administration prepare floats for a mooring deployment from the deck of a research vessel in Antarctica's Ross Sea. staffed platforms allow scientists to collect biological specimens, sea water, and sediment samples, to observe marine organisms, to conduct diving expeditions, and to deploy to manned and unmanned submersible vehicles. Instruments installed on drifting platforms measure oceanographic, atmospheric, and biological data along the path of an ocean current. Geological studies that seek to collect deep sediment cores, or to drill into crystalline rock, require platforms that are stable in shifting seas. Some platforms float around a central "moon pool" that isolates the drilling equipment from platform motion. Other drilling platforms stand above the sea surface on legs that are rooted in the seafloor. Most drilling platforms are too expensive for publicly funded scientific studies, but they are common equipment in the petroleum industry. Oil platforms over major petroleum reservoirs may house hundreds of staff members who live and work on the rig for weeks or months at a time. The petroleum industry also maintains smaller, unmanned platforms that house oil and gas pumps once an offshore field is established. SEE ALSO Carbon Dioxide in the Ocean and Atmosphere ; Climate and the Ocean ; Geospatial Technologies ; Ocean Currents ; Ocean-Floor Sediments ; Oceanography, Biological ; Oceanography, Chemical ; Oceanography, Geological ; Oceanography, Physical ; Petroleum from the Ocean ; Submarines and Submersibles . Irish, James D. et al. "The Next Generation Ocean Observing Buoy in Support of NASA's Earth Science Enterprise." Sea Technology 40, no. 5 (1999):37–43. Open University Course Team. Ocean Circulation. Oxford, U.K.: Pergamon Press, 1993. Weller, Robert, et al. "Outposts in the Ocean." Oceanus 42, no. 1 (1999):20–23. Global Ocean Ecosystem Dynamics. <http://www.pml.ac.uk/globec/main.htm> . The Global Ocean Observing System. Intergovernmental Oceanographic Commission (IOC). <http://ioc.unesco.org/goos/> .